My reader(s?) may have surmised that I have run out of ideas for my irregular series of Analog Enthusiast posts since the last installment was in August, but that isn't so! We're just getting started! If anything, the VHS tape is on its way to becoming "the new vinyl". Back in the 90's, during the CD boom, many music collectors would often say "I have that on vinyl"-- out of nostalgia or maybe even some kind of status. And in the glut of DVD and BluRay, so too do people like myself utter: "Oh, I have that on VHS." Where even so the videotape is now replaced by a technologically superior format, the conceit is the same: to have some affection for an obsolete device possibly because it speaks to a simpler and more youthful time. And as such, we're all full of stories about how the video tape has played a part in our lives as a consumer, or as a collector. As I mentioned in my piece on Interglobal Video in the "VHS RIP" issue of ESR, I unconditionally buy any title with an Interglobal logo. (For a better and more detailed explanation as to why I do, best to read the issue.) Yet, one movie released by Interglobal has eluded me for years-- until now. I speak of no other than the horror schlock title Twisted Brain. This delightfully bad flick has a special resonance for me, because my cousin John (whom I mentioned in my very first Analog Enthusiast post) had told me about this movie for years, because in the 1970's, Global television used to show it constantly at night. He and his friends would get together (in varying degrees of sobriety) and watch... plus poke fun at it. This piece of cult adulation had made me curious for a long time based on his loving anecdotes about it. One afternoon in 1987, I was strolling through Woolworth's on my lunch hour (during when I was a delivery driver for a flower shop), and lo and behold: there was a copy of Twisted Brain for ten bucks! Why, what was a person to do, other than to call John right away and tell him about it? Well, even though it was 12:30 in the afternoon, I had unknowingly gotten him out of bed when I called, as I hadn't realized he had just worked the night shift at the hotel. Nonetheless, he later told me that he went to Woolworth's in short order to pick it up. In fact, I had joked that one could see the burn marks from tire treads all over the mean streets of Simcoe as he hurriedly drove his car downtown. I should mention that John does not buy movies--- but he bought a copy of Twisted Brain. That alone should give some testament to the power of this film. And remember, this was back in a day when the act of buying movies was rare, as people would just rent films instead. The retail prices for pre-recorded VHS tapes were prohibitively expensive in the 1980's-- the only wallet-friendly videos one could buy would be from cheap public domain labels. Interglobal perhaps was the grandfather of all of these companies. As far as I know, it was the first to make an unprecedented move to stock movies for sale in department stores. Soon, companies like Star Classics and Goodtimes jumped on the bandwagon to likewise have films for sale in K-Mart. And to be sure, despite that you were getting a pre-recorded tape for the (then) steal price of ten bones, you weren't getting Criterion transfers. Twenty years on, a lot of these cheap tapes, transfered from already well-worn public domain prints, are barely watchable with their generation loss, persistent tracking problems and washed out colour. But in all fairness, many of Interglobal's titles are still actually pretty good... considering. 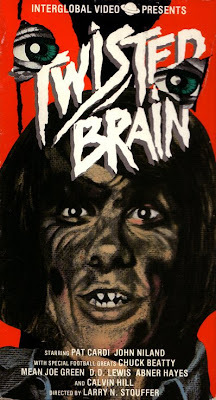 Their copy of Twisted Brain however looks like it was rescued from the bowels of Hell, and it is all the better for it. This film (also known as Horror High) is a sordid tale of a high-school nerd that is played to the nth degree. Vernon Potts (played by former child star Pat Cardi, of And Now Miguel and Let's Kill Uncle) is the archetypal wallflower with greasy hair, horned-rimmed glasses, pen holder, and socially displaced from all except his science teacher and his pet guinea pig, Mr. Mumbles. However, Vernon soon develops a potion which turns him into a monster so he can get revenge on all the jocks and teachers who picked on him. This movie was shot in 16mm (and as such, looks like a step above a home movie), then picked up by Crown International for distribution. Despite that there are lots of outrageous killings (including the scene where a janitor gets tossed in a vat of acid, causing John and his friends to yell out "Janitor in a drum!" -coining a popular cleaning solution of the time), I think the tawdry nature of the film also has an appeal to people like myself who have developed a soft spot for the movie. Perhaps because of the home movie feel to it, viewers may relate to it more, as it is a movie they could have made, and the locations are so generic, yet familiar, that they could easily be fragments of our childhood. And unless one was on the football team, there is likely a bit of Vernon in all of the viewers. Despite the novelty of football players like Joe Greene cast as police officers, and the hokey gore and violence, one has to hand it to the people for playing this movie straight. The excellent character actor Austin Stoker (of Assault on Precinct 13 and Battle for the Planet of the Apes) geniunely lends some class as the detective investigating all the murders around school. A few years back, Rhino acquired some Crown titles to put out a couple of boxed sets with the "Horrible Horror" banner-- this flick was among those picked. I haven't seen that DVD set, but apparently it was authored for DVD from a VHS source, but I would imagine that it didn't come from Interglobal. This bizarre narrative (including an overlong scene with Vernon's parents on vacation-- this is the only time you see them in the film) is given a further otherworldly feeling with all the blotchy blues and reds that a public domain tape can offer, and it looks like this was recorded from television with the commercials taken out (there are even old-school squiggly video breaks where the edits likely occured). The threadbare presentation of this tape actually compliments that of this film. After 30 years, the legacy of Twisted Brain lives on, thanks to those who became enchanted by this grimy flick from television or video. In the interim, Pat Cardi has spent a lot of time on message boards sounding off about what a thief Crown International is, and likewise hinting that a remastered version of this movie will happen soon. Personally, I'm not sure I want one. This is a rare film whose luster is from its very grimy nature. Interglobal could've cared less I'm sure, but they've enhanced that feeling even more. Hey kids, here's a neat poster for the movie. Here! Here! More bad VHS transfers! Those were the days, and still are, if you love movies like Greg does! 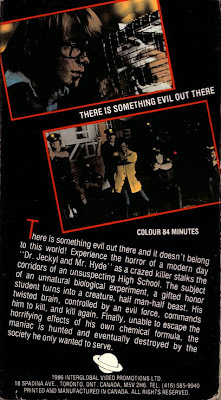 Hell, a bad VHS realistically evokes the 60s-70s experience of watching a bad movie on a crummy TV set with bad reception in the middle of the night when you are falling asleep! Movie watching as it should be! This obsession with remastering, while it is useful to clean up and arhcive obscure films, really misses the point - some films were meant to be seen in grimy, fuzzy, half-assed condition... as Greg points out so well.